With the SatStation Desktop Dock, you will enjoy all the features offered by the SatStation Hands Free Dock (hands-free voice and data communication) - without the installation! This desktop version is ideal for the office or home, and in situations where portability is required. It is efficiently designed to lay on a flat surface and blend into any professional environment or command center, and its hands-free mode is great for conference calling. The phone's built-in loudspeaker makes the ring very audible. The SatStation Desktop Dock allows for improved, portable communication while maintaining the benefits of a fixed phone. Since the dock is charging your satellite phone, you will have a fully charged phone ready to be used either at your command post or underway. The SatStation Desktop Dock has a TNC cable interface on the rear side to interface with a user-supplied antenna cable. It plugs into a standard AC wall outlet. To use the Desktop Dock, users will first insert the included RF adapter into the antenna adapter port of their Iridium 9555. 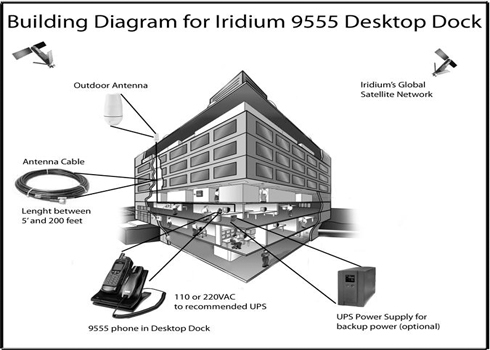 Then, simply place the Iridium satellite phone on the docking station cradle and it is ready to go. The cradle securely holds the phone and connects it to an external antenna. While the phone is in the cradle, the battery is charging. The SatStation speaker amplifies the ringer so it can be heard from several rooms away. The user can use the Iridium phone’s key pad to answer or make a satellite phone call in hands-free mode. The SatStation’s echo-canceling microphone enables the user to enjoy hands-free operation even in noisy environments such as a boat, car or work site. The privacy handset included can be used to answer and terminate calls. Using the handset toggle button, the SatStation user can easily switch a call from privacy to hands-free mode and vice-versa. The Audio-out port allows for the recording of conversations.